Hortus Camdenensis | Rosa microphylla Roxb. Catherine Gore considered Rosa microphylla Roxb. to be related to Rosa bracteata the ‘Macartney Rose’. She describes its flowers as solitary, very double, pale pink, more vivid in the centre. This is probably identical with Rosa roxburghii Tratt. plena, also known as the ‘Chestnut rose’, ‘Burr rose’; ‘Chinquapin rose’, from China and Japan, introduced prior to 1814. It is described in recent publications as a vigorous, stiff-growing species with up to 19 narrow leaflets, more usually 7, and solitary, double, lilac-pink flowers, to 8cm across, which open from prickly buds in summer, to 2m by 2m, a description consistent with Gore. 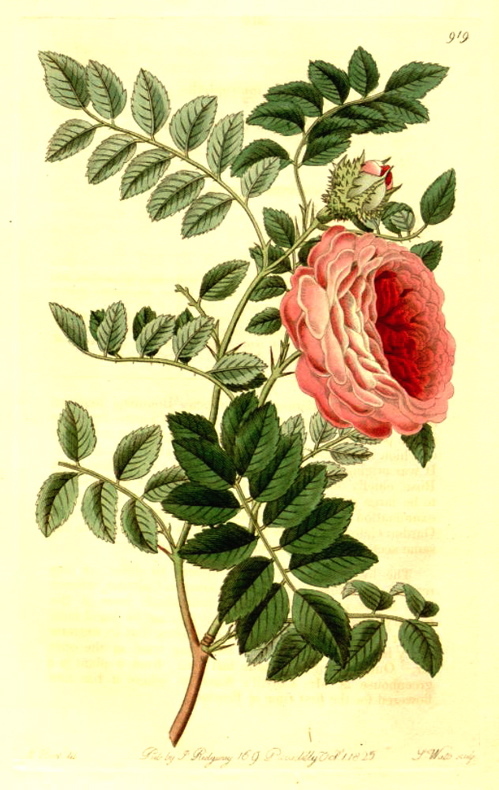 Rivers states that Rosa microphylla rubra was introduced from the east in 1823: ‘It is nearly allied to the Macartney, and is most probably a Chinese hybrid of that rose.’ [Rivers (1854, 1857, 1863)]. A plant under the name of Rosa microphylla was figured in the Botanical Register by John Lindley: ‘It was originally supposed to be related to the Macartney Rose, but on a subsequent examination it is ascertained to be referable to the same section as the Rosa indica of the gardens’, a statement consistent with Rivers’ opinion. Lindley’s figure is consistent with the descriptions given here, the unopened buds very much resembling a burr. [BR f.919/1825]. Listed in the 1845, 1850 and 1857 catalogues [T.864/1845]. A plant was presented to the Sydney Botanic Garden by William Macarthur on September 15th 1847 [RBGS AB]. Rosa microphylla Desf. is a form of Rosa sempervirens. More details about Rosa microphylla Roxb.